In 1814, three cousins—Gretchen, Emma, and Penelope—discover their family lineage of witchcraft when a binding spell is broken, allowing their individual magical powers to manifest. Now, beyond the manicured gardens and ballrooms of Regency London, an alluring underworld available only to those with power is revealed to the cousins. By claiming their power, the three cousins have accidentally opened the gates to the underworld. 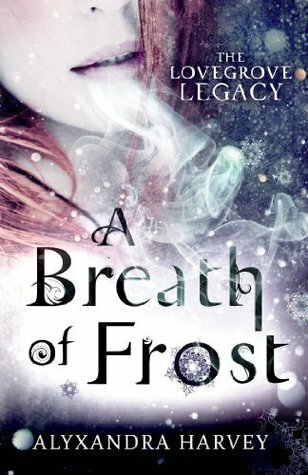 I’ve read a couple books by Alyxandra Harvey before – she is a Canadian author, after all – and they were good, but I didn’t love them like I did A Breath of Frost. Probably because those books weren’t about witches. Damn, I love witches! And Harvey does a good job of adding her own spin onto the tried and true witchy formula. In Harvey’s alternate London, the distinction between witches and warlocks isn’t based on gender, but character: witches fight for the forces of good and warlocks for evil. Spells can be found inside pouches of herbs and glass bottles, as well as spoken. We’re also given glimpses of a magical goblin market hidden within London where spell casters for hire trade in dreams, witches eyeballs, and teeth. Hopefully the goblin market will become a bigger part of the series because it was seriously awesome. Lots of people toeing the line between good and evil. There are some wonderful moments where Harvey explores this predisposition to evil acts, questioning whether blood is enough to predict someone’s behaviour. Through Ewan, a character with quite the genetic predisposition, Harvey suggests that love is a more powerful force than blood. Loving someone(s) can free you from darkness because it gives you the strength and support to choose for yourself. Love is the most powerful magic of all, people! I’m such a sucker for that stuff. And there’s a lot of love in A Breath of Frost. Protagonist Emma Day and her cousins Gretchen and Penelope have a wonderful relationship, one built on love, loyalty, and of course some good old fashioned mischief. In many ways they seemed more like sisters than cousins. As they begin to come into their own as witches, these three learn that they are most powerful when working together; they often join forces to protect each other from harm. I especially enjoyed how Emma and Gretchen gave a verbal smackdown to a boy who’d called Penelope fat. Oh ho, buddy. EVERYONE knows that you don’t call a girl fat unless you can handle some serious whoopass. Or in this case, witchy juju. Unfortunately the cousins know very little about said juju, since they’ve all been kept in the dark about their abilities (of course). So when the girls’ powers begin to manifest and they start seeing things that by all rights should not exist, they’re understandably a little wigged. Emma is especially affected, since her mother is infamous for her supposed “delusions” and “insanity.” Want to know what the real deal is? Read the book, people! The Greymalkin Sisters were alright villains, although I did think that they were a little too evil to be believed. Slaughtering innocents and generally causing mayhem when you actually have a plan is one thing. Doing it because you’re just that evil? That’s a pretty lame justification if you ask me. Only one of the Sisters actually has a real reason for her vindictiveness, and it’s because her beau died on the moors. Like 200 years ago. Talk about holding onto the past. There were quite a few twists and turns in A Breath of Frost, some of which I saw coming from miles away and others that pleasantly surprised me. The seeds for Gretchen and Penelope’s books have definitely been planted, and I for one cannot wait. I’m especially excited by Penelope’s story, the third planned book in the series, as it offers the tantalizing prospect of a Victorian fantasy novel that delves deeply into issues of classism. A Breath of Frost marks the beginning of an exciting new series, one perfectly suited to anyone who enjoys YA fantasy or historical fantasy. This sounds great, actually. I’m usually a bit wary about YA books about witches (after my not-so-great experience with Beautiful Creatures) but this one looks really interesting, especially with the alternate London setting! Ohhh my gosh, Beautiful Creatures was horrific. All I can remember about that book was the awful narrative voice: “my girlfriend Lena is so pretty. She wears white sundresses with over the knee boots and statement necklaces and I care a lot about women’s fashion for some reason.” No worries, A Breath of Frost is leagues above Beautiful Creatures! Oooh, I didn’t realize that Alyxandra Harvey is Canadian! Perhaps I’ll have to give her books a second look, and now after reading your review I’m thinking that A Breath of Frost might be a good place to start. I always enjoy a good twist, so thanks for bringing this author to my attention! No worries! You know I love spreading the word about authors from our neck of the woods 😉 I think you’d really like Harvey’s writing; she’s a good writer with a wonderful sense of humor. I agree with the I dont’ believe in evil for evils sake type of villainy. So they could have been improved, though the last villain you know who i mean – I totally understood hers. I’m so glad you enjoyed this one just as much as I did. I love bonds of family love when they are featured. Oh, I know who you mean – and I was actually pretty surprised that she was a villain! Call me dumb, but I didn’t see that coming. The family aspect of this series is one of the best things about it; I especially loved Penelope’s parents and how “bohemian” they were, hahaha. Oh you’re Canadian? Me too. ^_^ And I did read some books by this author too, the Drake Chronicles. REALLY loved them. Was curious about this one so bought it. After your review, I am more positive than ever to try it. PS. I love witches too!!! YASS Canadian book bloggers! Very cool. 🙂 The best thing about the Drake Chronicles – in my opinion, anyway – was Lucy and her hilariousness. A Breath of Frost definitely has some of that humor going on. I totally agree on witch UF vs. vamp UF. Witches forever! I have a feeling that the villains are only going to get bigger and badder as the series progresses…hopefully they’ll have better motivations, too! I don’t like witches that well usually, but I do like settings in London so that sounds good. Good review, Danya! You have me interested. Thanks, Jan! I’m a bit biased, being an intense witch fan myself, but I think you’d enjoy this one nonetheless. London is very atmospheric and plays a large role in the story.